Heat oil in a deep-sided pot/pan. Oil should heat to 340°F before frying. Lay out the shrimp, pat dry, and season. Set up three shallow bowls for the dredging process: one with flour, paprika, cayenne pepper, white pepper, and salt; a second with eggs and water whisked together; and a third with breadcrumbs and shredded coconut. 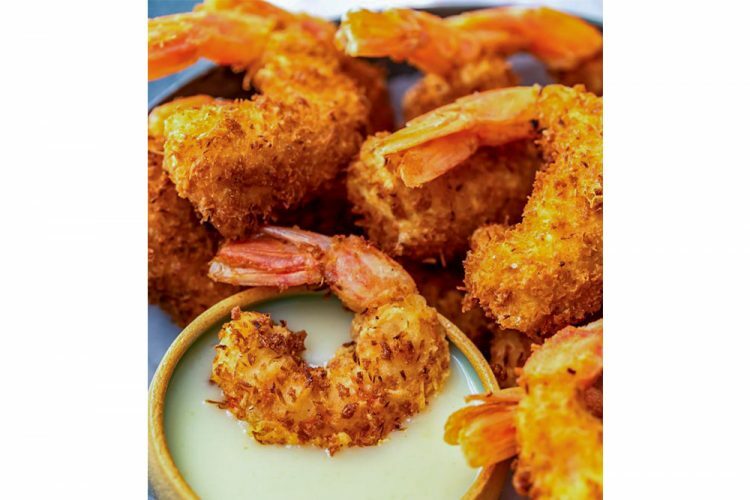 Dip the shrimp in the flour mixture, then the eggs, then the breadcrumb/coconut mixture. Dip it a second time in the eggs, and again in the breadcrumbs. Then place it in the hot oil to fry. Basically, all you have to do is mix the ingredients together, let the sauce simmer to thicken up, and then serve it with the shrimp. It could be done in advance as well.